The Rideau Transit Group assured riders today that it will meet its March 31st deadline to hand over the "keys" to the LRT. But the head of Ottawa's transit system isn't convinced of that. John Manconi said he'd be happy to be proved wrong but believes there are too many outstanding issues. "Skeptical" is the word Manconi used, given that we are just 47 days away from that deadline. Despite being far apart on that issue, what the two sides could agree on was what a world-class system it'll be when it's actually up and running. With a push of a computer key, the 360-degree virtual tour on the OC Transpo website takes you down the stairs and onto the platform at Lyon Station; one of the 13 stations on the Confederation Line, the first phase of the LRT. If only getting onto the real LRT were that easy. 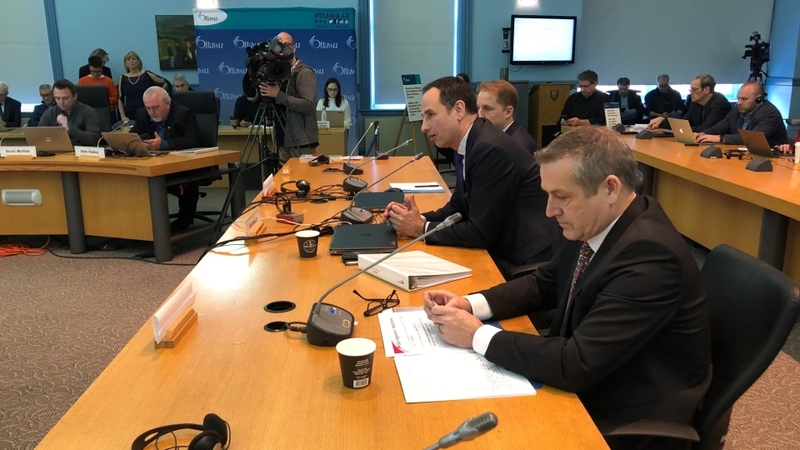 “I am still confident we will met obligation and hand over on the 31st of March,” Peter Lauch, the CEO of Rideau Transit Group told councillors at the finance and economic development committee meeting, explaining how its new third deadline is the one it will make. But Ottawa’s Mayor wasn’t convinced. “Why should we believe you'll meet this deadline of March 31st,” he asked Lauch, “when on two other occasions you didn't come close to it?" The Mayor reminded RTG that there's a penalty of $1 million dollars for missing deadlines. Lauch was referring to 8 elements critical to the RSA or Revenue Service Availability, including fleet availability, station occupancy for all stations, tunnel ventilation, testing of the train control system and RTG’s system assurance required by the city’s Safety Auditor. The Confederation Line is a $2 billion dollar project; the largest civic project in Ottawa's history. OC Transpo's GM John Manconi agreed with Deans, saying we've got one shot to get it right. Transit riders would certainly agree with that, despite the headaches the delays have caused. “I'll believe it when I see it and I can actually step on it,” said another man. So, when will that day happen? Manconi says the next few weeks will be critical reconciling those 8 outstanding issues before inspectors and the city sign off on this. Transportation GM John Manconi (centre) speaks to the Finance and Economic Development Commitee flanked by RTG CEO Peter Lauch (close) and LRT Construction Director Michael Morgan (far) Feb. 12, 2019.